Home > Patient > Defensive Medicine: Health protocol of tomorrow? Defensive Medicine: Health protocol of tomorrow? “I will prescribe regimen for the good of my patients according to my ability and my judgment and never do harm to anyone”- Hippocrates . Even the Oath we take will not apply everywhere now. “Defensive medicine, also called defensive medical decision making, refers to the practice of recommending a diagnostic test or treatment that is not necessarily the best option for the patient, but an option that mainly serves the function to protect the physician against the patient as potential plaintiff.” – Wikipedia, though wiki is not much popular among doctors as a source to Quote to, still reading the definition, to me , it made the entire sense. Currently looking at the state of health scenario rising in South Asian countries, primarily India and Nepal, there is a clear sign on the horizon that the countries are rapidly drifting to defensive medicine, an art practiced in the West. The rate at which the medico-legal cases doctors and medical professionals are being pulled into both necessarily and unnecessarily, it is pretty certain that the expense of health care is going to double and multiply rapidly for the patients and general people. So who will benefit from the Defensive practice? Lets look at articles around the globe. In 2004, the case of Dr. Daniel Merenstein triggered an intensive debate in scientific journals and media on defensive medicine. Following the guidelines of several well-respected national organizations, Merenstein had explained the pros and cons of prostate-specific antigen (PSA) testing to a patient, rather than simply ordering the test. He then documented the shared decision not to order the test. Later, the patient was diagnosed with incurable advanced prostate cancer, and Merenstein and his residency were sued for not ordering the test. Although Merenstein was acquitted, his residency was found liable for $1 million. Ever since this ordeal, he regards his patients as potential plaintiffs: ‘I or der more tests now, am more nervous around patients: I am no longer the doctor I should be’. In a study done in USA, among the total 824 surgeons, obstetricians, and other specialists doctors working at high risk were included. About 93% of them reported that they were practicing defensive medicine, with excessive investigations and procedures. Why are medico-legal cases blooming? The way the courts have ordered huge compensation makes it a Lottery more easier to win than the American lotto. A try on suing a doctor gives you a fair chance of becoming rich. The economic cost to the society is huge. The results of a recent national survey of orthopedic surgeons in the US were published in a peer-reviewed medical journal last year. This article noted that the estimated cost of defensive medicine in the US for the specialty of orthopedic surgery alone is 2 billion dollars annually. 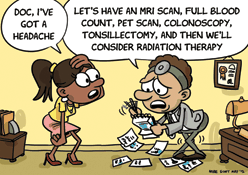 One can easily understand the cost to the individual patient from interventions such as excessive use of computed tomography (CT) scans with resultant exposure to harmful radiations. The fear of rising liability on the part of doctors is also likely to make them hesitant in performing the role of the Good Samaritan in emergency situations; or giving curbside opinions which is currently commonplace in India and often very helpful. Finally, a major concern would be an increase in frivolous allegations of medical negligence which do not result in any benefit to the patients or the doctors, but result in increased procedural costs and medical liability premiums. At last-A worth reading article- Why are doctors ordering too many tests?